I've started a quilt for my bed to commemorate my darling Sieuwke. When I brought Sieuwke home from the shelter he was given a room of his own. In order to get Muis and Sieuwke to get along, a proper introduction was crucial. 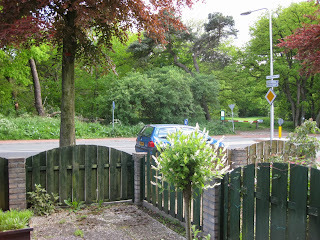 After all Muis was 15 yrs old, still grieving over Nils, and Sieuwke was extremely timid. So Sieuwke started his new life in his very own room, and was given plenty of time to take it all in. I visited him a number of times during the day to provide food and water, and spend some time with him. On those occasions I used to have some small sewing project handy so he wouldn't feel like the center of attention because he was so timid. I finished hand quilting a tablecloth while he napped in his safe spot between two cabinets. That tablecloth was a Courthouse steps quilt. In his final hours Sieuwke wanted to be in the bedroom, which is why I chose to do a quilt for my bed. I'm sewing the blocks on the Singer 127, my oldest machine. The Singer 15 will also be involved at a later stage. 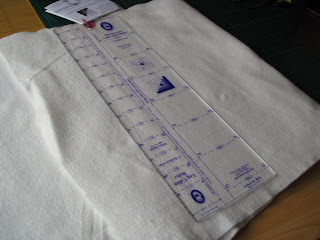 I'm going to use the 15 for the quilting and to sew on the binding, because I want to use a hinged foot for that. I've cut all the strips with the Log Cabin ruler (Marti Michell). It's a dream to use and you have your strips ready to go in no time at all. After cutting your strips you can then proceed to sew them assembly-line style. BUT, and I can't stress this enough, do make sure your 1/4" seam allowances are spot on. Otherwise every next piece you add won't fit. So if the piece you add is longer or shorter, make sure you fix it before you continue. In case you're wondering, yes I got mine wrong on 10 blocks, :-). 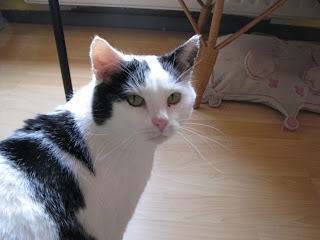 On October 18th at 5.30 pm my gentle Sieuwke has passed away. Sieuwke died at home in my arms with no pain. He was only six years old. Sis and I went to our favourite yarn shop last Friday. As always when we go on trips we had a great time. For the time being I decided to get yarn for two cardigans. So now I have plenty of yarn for the 1960 cardigan plus another cardigan that I noticed when I was browsing the knitting magazines. In fact the two magazines I've bought have four potential candidates for future knitting, provided the first two cardigans go well. I started knitting right away when we got home from the yarn shop. Prior to our trip I had already done a rather large swatch for the 1960 cardigan. As it turns out, I did need to go down two needle sizes, but that's normal for the technique I use. A major difference for me, compared to knitting socks, is the tension. The tension required for a cardigan is much tighter than I'm used to. Another reason why I went down two needle sizes. And it felt so weird to use only two needles instead of the usual five when I knit a sock. 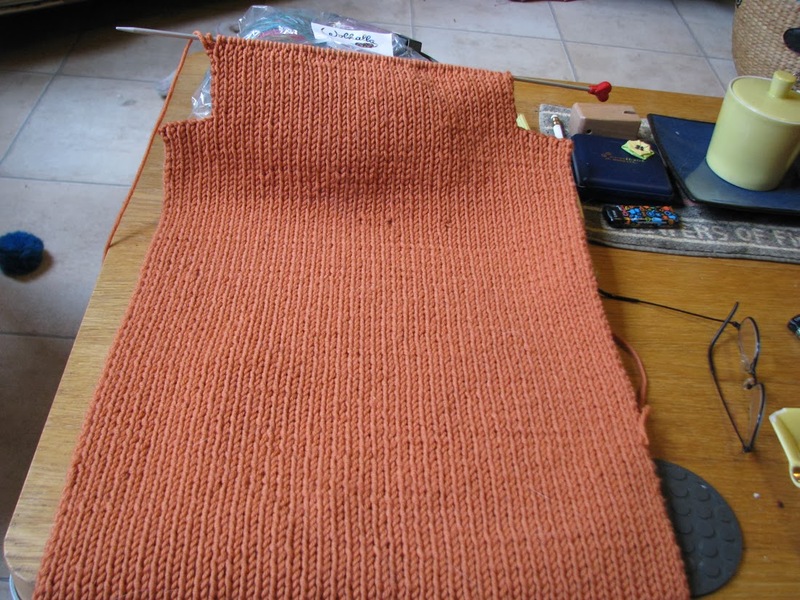 On another note, I'm nearly done knitting the back of the 1960 cardigan. 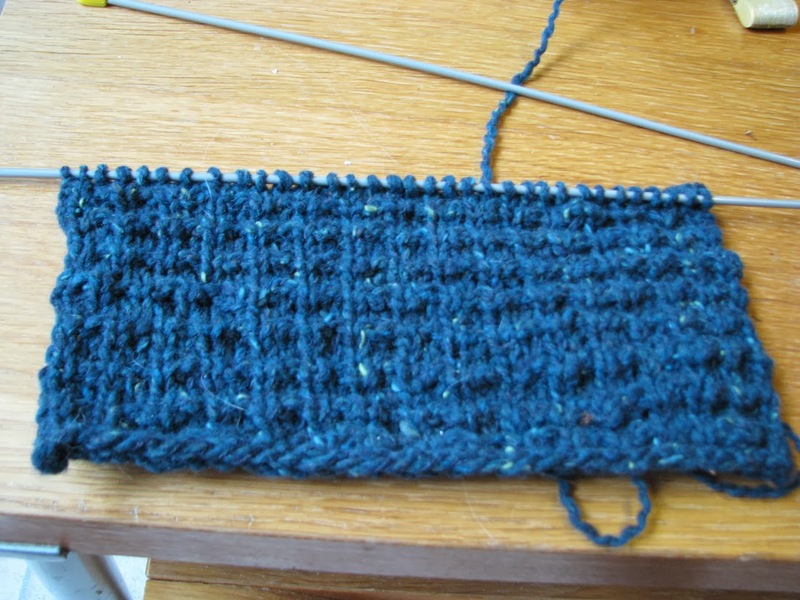 If it seems too narrow to you, don't worry, because it's being knitted in ribbing stitch entirely. I can assure you that it's quite stretchy. As you can see, I've just started the armhole. I now need to work 8" as is, then proceed with the rest of the armhole. The yarn is called Bingo, and it's from Lana Grossa. 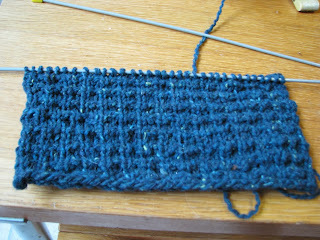 Of course I couldn't wait to see how the other yarn would look like, so I knitted a swatch. I have no idea how the stitch is called, as it wasn't specified in the directions, but I sure like the look of it. It's a cardigan pattern as well, made entirely in that stitch. This yarn too is Lana Grossa, and it's called Royal Tweed. I find it a little harder to knit with, but it's very pretty and the stitch is so fun to do. My sister advised me to do at least one cardigan from a magazine, because you can use the exact same yarn as used in the design, making it more likely that the result will look the same. I have no picture of the design, but it's a very simple long cardigan with straight sleeves and a collar. 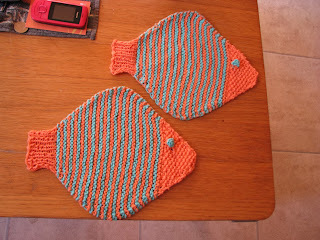 Oh, I can show you some finished knitting as well. When I bought the vintage cardigan patterns on Etsy I also bought this irresistible pattern for dishcloths. They were so much fun to make! Cheerful, aren't they? Lastly, I'm still contemplating what to do about a quilt for my draughty bedroom. 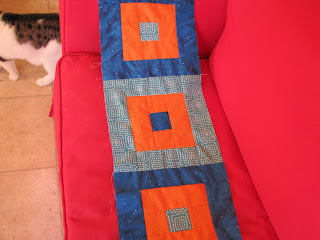 I've decided that hand quilting would be too time consuming. After all I'm still hand quilting the lap quilt for my sister. I would prefer not to start another hand quilting project while hers isn't finished yet. I've looked at quilts in shops, but I can't find any color I like. All the colors are ever so boring: greys, taupe, white..... bleh. But how would I go about machine quilting? Free motion quilting is out. It would take me too long to learn. Most likely I could do a large quilt by hand faster than attempting to get a remotely decent result by free motion quilting. Besides, I would have to do it on my Pfaff, because my vintage Singers are hand cranks. Plus, if I use a vintage Singer for the patchwork top, I would prefer not to use an electric machine to quilt it, It just doesn't seem right somehow. So the solution might be to quilt in the ditch by machine. If I do a log cabin top, all I would need to do is stitch the outlines of each block. Meaning I would have to do straight lines only, lengthwise and crosswise. I suppose it won't be easy anyway, because I'm not used to handling such an amount of fabric with any machine, but since it'd be straight lines it might work. Although the weather has been lovely in the daytime so far, nights are starting to get chilly. I live in an old house opposite a wood. When I sit on my sofa and look out of the window all I see is trees, bushes and a path leading into the wood. This picture was taken last Spring. It always sets off with the small trees and bushes, and gradually all the other trees follow. And it's such a thrill after looking at bare trees all Winter. Winters always last far too long, and I hate them with a passion. But bare trees aren't the only reason I hate winters. The house has central heating, but only the living room is relatively warm during winters, not the bedrooms upstairs. Which is unfortunate, because my sewing room is upstairs, and so is my bedroom. Anyway, last winter I consulted the housing company about it. Turns out that the HR-boiler is set up to heat bedrooms to 15 degrees Celsius max. Apparently you can request to change that, but then I would have to worry about my energy bill. So that's not an option. To make matters worse, we have those ventilation things (I don't know what to call them) in the windows. Well, the thing is I have to leave them open at all times. If I don't the air gets too humid, which results in an even chillier feel in whatever room you're in. So I leave the vents open all the time, meaning I feel the wind blow over my face when I'm in bed. And with temperatures below zero that's no fun. So I'm thinking about a quilt to put on top of my bedding for extra warmth, since my bedroom is so draughty. But will I just buy one from Ikea or make one? At the moment it's more likely that I'm getting a bedspread/quilt from Ikea. It would serve its purpose this winter, and give me more time to make myself a nice quilt. After all, there's the size to consider. My bed is 47.25" wide and I want a decent overlap to keep warm and for appearance. Well now, a quilt top goes together fairly quickly, but after that you still need to quilt it. And I'm a hand quilter. Of course I could try to machine quilt it, I suppose. Yet, that would mean handling a sizable quilt on a domestic sewing machine. Would that actually save time? Still, it's tempting, I must say.